The final Buffalo Bore load is the 250gr JHP. The manufacturer says this is a load designed for deer hunting and has a bullet designed to expand at pistol velocities. At a claimed velocity of 2250fps and matching speed of 2249fps from my rifle, this load certainly was faster than pistol velocities can produced the fastest speeds of any round I tested among this group. It was acceptably accurate at 2.5” for five shots at 100 yards. So this brings us to accuracy and the mechanical accuracy of the rifle itself. My gun performed very differently with each of these loads and I had accuracy issues with the gun itself, not the ammo. I discovered that another problem that resulted from the magazines as the restriction of the action. I am not an expert on this by any means, but I noticed that the magazines had a real effect on how the gun shot. When I loaded the gun with a single round and fired for group, it produced excellent accuracy. When I put a loaded mag in, I had groups open up and spray all over, often raising group size to double what they were. I discovered that when I used the Lancer magazines with the Tromix followers, the accuracy tightened. My thought on this is that the upward pressure being placed on the bolt carrier caused minute flex and put pressure on the upper receiver, pushing it away from the lower. This stress then caused the bolt carrier to operate sluggishly or move irregularly. 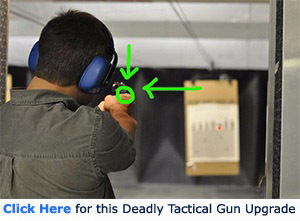 Does this mean that you have to be careful of what mags you use in your .450 rifle? At least in an AR you might be. The AR is a design that wasn’t made to handle these big-bore rounds and is somewhat fragile to begin with, thus making a complex situation of trying to maintain accuracy while various pressure is exerted on your moving parts. The best thing that can be done for accuracy in a .450 is to not try to stuff so many rounds into a mag that the bolt can’t travel. A topic that I brought up in my last article was case taper. The .450 is a straight walled case in that it has no bottleneck. It does have a minute taper from base to mouth and as a result the rounds can lift in the magazine. I noticed that there were some small differences in the shape of the Buffalo Bore loads as opposed to the Hornady offerings. The Buffalo Bore cases, most notably that of the 300gr JHP, has what could only be described as an undetectable difference in case taper that made it easier for them to lift up in the magazine with a standard follower installed. This problem vanished with the Tromix followers. In the future there will likely be more good .450 loads available. I will be testing handloads in an upcoming article and what you can expect to see when rolling your own using some very fascinating bullets. The fact that the .450 is rapidly gaining popularity only serves to make me believe that I’ll see some fantastic bullets and amazing ammo types in the future. There isn’t much you can’t do with the loads I tested here, but it will certainly be nice to see the future of this cartridge.